Phoenix Rising is a simple but powerful form of bodymind therapy in which you are encouraged to explore your own internal landscape and experience how your inner life manifests in and through your body. The practitioner does not interpret or advise but acts as a compassionate witness, creating a space in which you are able to access your own innate wisdom. You don’t need to be fit or flexible to receive this work, or to have any experience of yoga. However, if you do already have a yoga practice, Phoenix Rising is a great way to work more deeply into postures and explore your physical and emotional edge. What happens in a session? Phoenix Rising sessions are one-to-one and last about 90 minutes. Having a session is more like receiving bodywork and a therapy session at the same time than attending a yoga class. 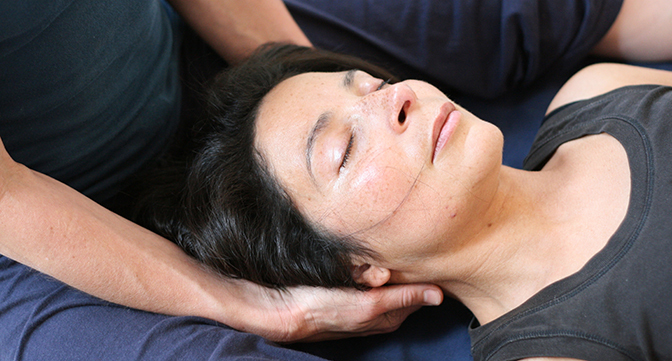 The practitioner moves your body into supported yoga postures and uses simple dialogue techniques (derived from person-centred therapy) to enable you to let go of physical and emotional tensions, release energetic blocks, and experience a deeper sense of connection and awareness. In Phoenix Rising, the practitioner acts as a guide, but you are in charge of what happens. You won’t be asked to enter into any dialogue or posture that doesn’t feel right for you. What is it useful for? Phoenix Rising can be helpful in working with a wide range of psychological and emotional issues. Some of the experiences clients have brought to the mat include sexual and other abuse, trauma, eating disorders, addiction, questions of gender and sexual identity, depression, grief, life crises and making transitions. Other people don’t have any particular ‘problem’ but use Phoenix Rising as a tool of general self-growth and awareness. While Phoenix Rising may help in the healing of injuries and illnesses, the main intention of this work is to enable you to enter deeply into your own feelings and experiences, so if your aim is simply to find functional solutions to injury or illness, you will probably find a more biomechanical or medical model of work more appropriate. Where does it come from? Phoenix Rising was created in the early 1980s by Michael Lee, an Australian then living at Kripalu yoga ashram in Massachusetts, USA. Through working on himself and assisting others to move more deeply into their own yoga practice, Michael came to realise that profound emotional and physical release could be facilitated by the supportive presence of a partner. From this experience, he began to evolve Phoenix Rising yoga therapy. The first training programme for practitioners took place in 1987, and today the Phoenix Rising Yoga Therapy Center, now based in Vermont, trains new practitioners every year, from the US and from countries around the world.